Comment: I've cleaned the unit but can use a bit more cleaning. Comes with flat cooking plates. 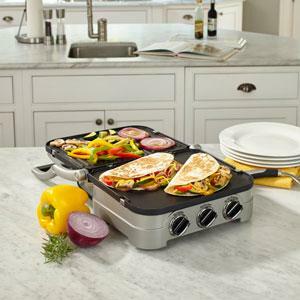 Rigid cooking plates not included. A piece of the plastic at the back of the unit has snapped off, does not effect utilization of the item. 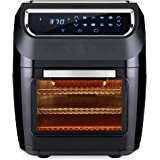 Amazon's Choice for "indoor grill"
Save an extra $5.96 when you apply this coupon. $5.96 extra savings coupon applied at checkout. Sold by gvode inc and ships from Amazon Fulfillment. 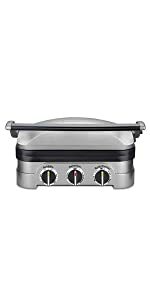 The 5-in-1 Griddler can handle everything from pancakes to sausages to grilled cheese to steaks, hamburgers and Panini's. 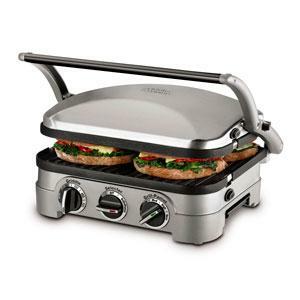 The Griddler is simple to use and clean up is easy with the nonstick, removable dishwasher safe plates. 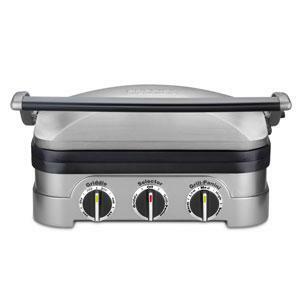 The selector knob lets you choose the grill or griddle function and each function features adjustable temperature controls. 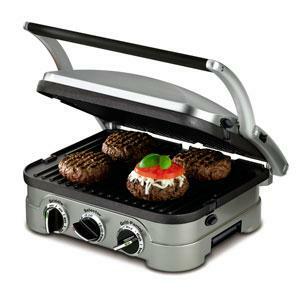 Red and green indicator lights let you know when your Griddler has reached your desired temperature and is ready to cook. 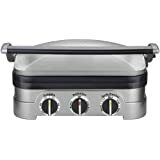 Use your grill in the closed position to cook everything from chicken and hamburgers to juicy steaks. 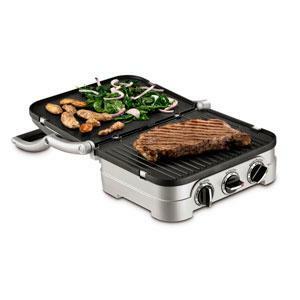 Double your grilling surface size by using the grill plates in the open position for a full grill. 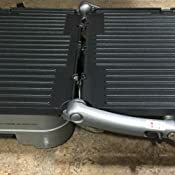 Use the griddle plates in the open position for a full griddle. 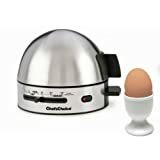 Perfect for cooking eggs, pancakes bacon and more. 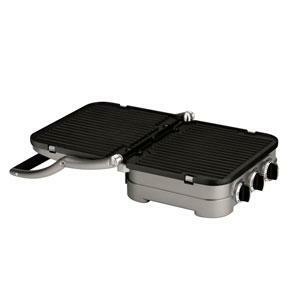 Use one grill plate and one griddle plate to grill and griddle at the same time! 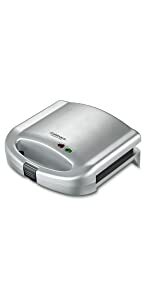 The sturdy Panini-style handle with hinged floating cover helps you make the perfect Panini. 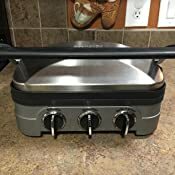 I am sad that I cannot give this a full 5 stars, but since Cuisinart refuses to answer my concerns about this product, I must make sure the people are aware of the issues. I have bought two of these in less than 6 years. I take really good care of my items; I still have the original box and foam inserts just in case I needed to move it or ship it back for warranty purposes (explanation in a minute). 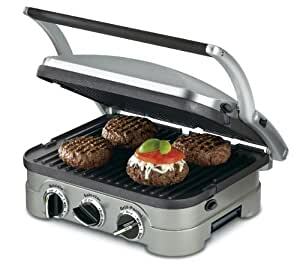 The side buttons that you push to pop out the grill plates are plastic and one will break after a couple years of frequent use. That means, you have no button to push and the metal underneath is inside the machine-not easy to access. 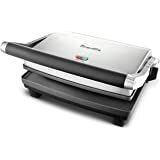 I bought the second panini grill for the same issues as the first one in March 2015, not having kept original receipt to know if it was under warranty, so I was thrilled to see that this one was still within the three year warranty. I called the Warranty number and was told that I'd have to ship it back and the cost was on me. You're also expected per their warranty paperwork to pay an additional $10 to get a repaired/refurbished/potentially new one back. I did ask to have that second fee waived, as it seemed unfair. So, I go to the U.S. Post Office with the machine in its original pristine box. It was $38.12 to ship via ground and $42 for priority. I was shocked. The box looks so brand new that the agent assumed it was and she joked to the other postal worker did she want to buy it from me? I explained that it needed repair and her jaw dropped. She too thought it was absurd that they would not send me a postal order as the weight and the fact it has to go cross-country is what makes the shipping so much. I decided that for more than half the price of the item, it didn't make sense to ship. I checked with UPS and they too were over $24. I mean, I can see paying $15, but this is too much money for a $59.99 item (that I paid $91 with tax in 2015 when it was still a higher price as their newer model). 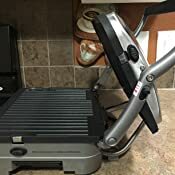 So I called Cuisinart back and explained my case. I was told that if I wanted to use the Warranty, I had to ship it because that is what I agreed to-did I have a choice? They wouldn't even offer me $34 towards a brand new one. 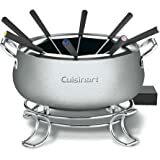 I really loved this product and am disappointed that Cuisinart makes their warranty policy difficult to honor. I even contacted them on Facebook privately to see if they'd look into my case and work with me, but they didn't even bother to respond. I wonder if the extended warranty offered here on Amazon by the third party would not make me jump through hoops if I wanted to buy another one. Just not sure I am wasting my money or not. I don't like the ethics of a warranty that costs you a fortune in order of fit to be honored. 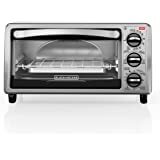 -Warranty is three years, but if you contact them, they require you to ship the entire product back and shipping is over $34 through the U.S. Postal Service on ground shipping (not priority). You're expected to pay $10 in addition to get a repaired/refurbished/potentially new one back. 5.0 out of 5 starsAwesome grill! 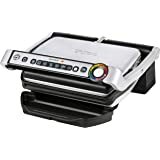 I purchased this Cuisinart Griddler because my husband and I just weren’t happy with our George Foreman Grill George Foreman GRP1060B 4 Serving Removable Plate Grill, Black. 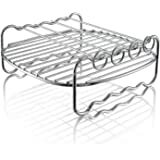 It didn't have temperature adjustment, the drip tray would melt every time hot grease would drip in it (or after being put in the top rack of dishwasher), and it just wasn't big enough really. 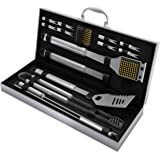 When I came across this one on Amazon with such stellar reviews, I thought this would be the one for us. 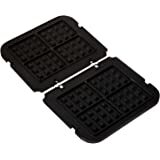 So I ordered it along with the waffle attachment Cuisinart GR-WAFP Griddler Waffle Plates. I have used it at least ten times since I received it. 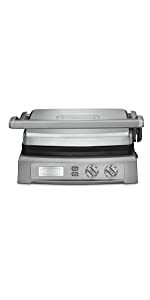 So far I have cooked eggs, bacon, pork chops, toast, a Philly steak sandwich, and waffles (with the waffle plates I purchased separately). Everything has turned out great except the first time I cooked eggs on it because I didn't use cooking spray on it beforehand. So keep in mind that you will need to lightly spray the plates with cooking spray or use butter before placing your items on it that may stick. 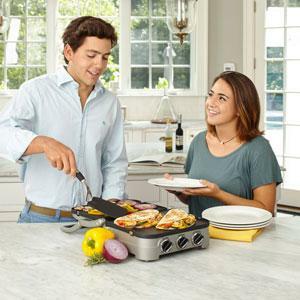 I love that I have the option of using either the griddle or the grill plates. 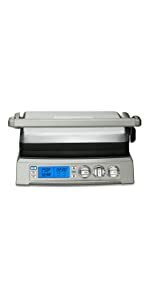 When you use the Griddle setting you get to select a temperature between 200 up to 425 degrees. 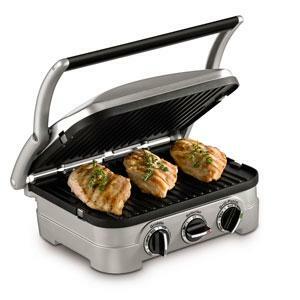 If you use the Grill/Panini setting you select your temperature as either warm, low, medium, high, and sear. There are also marks in between those settings so you are able to get a setting of medium-high for example. 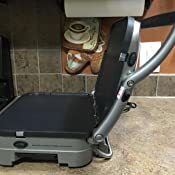 The plates (including the waffle plates) are dishwasher safe but after owning the George Foreman for years I am choosing to hand wash my plates on this Cuisinart. When I would put the George Foreman plates in the dishwasher it would never seem to get them very clean. I guess it is just too difficult to cut through all that grease and stuck on food that was burned on. It is super easy to clean the plates on this Cuisinart though. 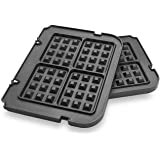 The non-stick plates make it where I can just wipe the mess right up with little to no effort. Very nice. 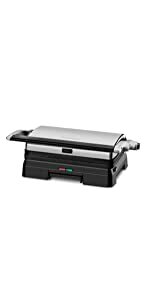 I like that the drip tray on this grill is attached underneath the unit. That was a big frustration for me with the other grill. 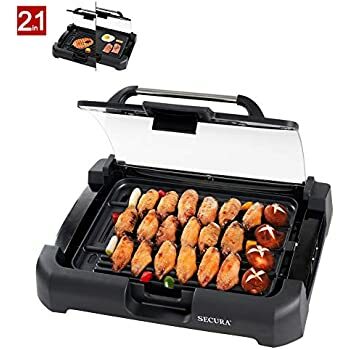 To constantly have to place it under the grill in just the right spot, then find something to do with it until it cooled down. I have furbabies so I didn't want to leave it out because they look at it as "oh look, a meal!" Since this drip tray is attached I can pull it out and clean it when I please and then place it right back into the slot. Easy peasy. 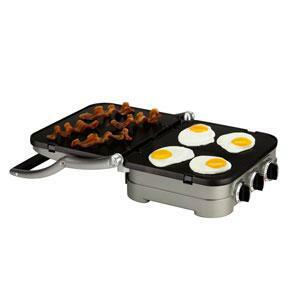 I love that I can fold this unit flat and make bacon, eggs, and toast all at the same time. It is wonderful. 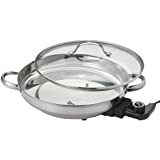 It is so nice not to have to dirty up a bunch of pots and pans and tun on my range all the time. Overall I really am proud of this Griddler. 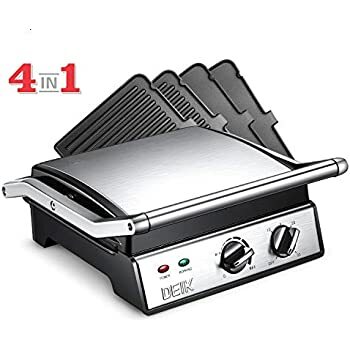 It has been a welcome replacement to our old grill and is definitely one of my best Amazon purchases. 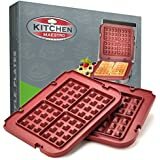 I'm a chef, so perhaps my expectations are too high, but I was entirely disappointed in this product. It has so much promise, but it looks and feels cheaply made. 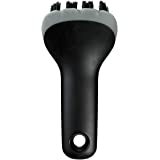 It is very light, and it rattles when you move it because none of the parts fit snugly. I can't imagine it has the durability to last long especially if is used a lot. The grease trap is awkward and a bit of a challenge to remove. It does not cook well. 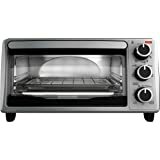 The handbook says it takes 10 minutes to heat up - try more like 20 minutes. 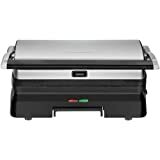 The minute you put food on it, the temperature drops precipitously, so for most of the cooking time, the grill is struggling to get up to temp. 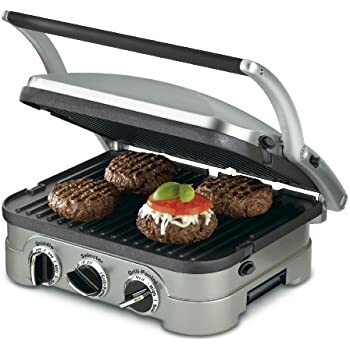 The pannini function is sketchy at best because the top griddle is not heavy enough to heat product effectively or to get good grill marks. 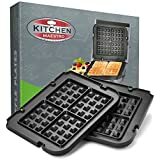 As a professional cook, I would not purchase or recommend this product. A good cast iron skillet does a better job and lasts forever. 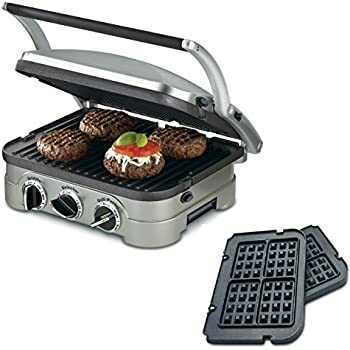 As it is, the griddle does not live up to the Cusinart name, which until I ordered this, has always meant good quality products that cook well and last a long time - not this one.